A big “dhanyabad” (thank you) for all your lovely messages and support. Apologies for the teething glitches with the blog, two of the five pictures and the title were not uploaded with the first one, but these are now on the site. Also, apologies for the occasional typo, but we have been composing this at 2 am local time! 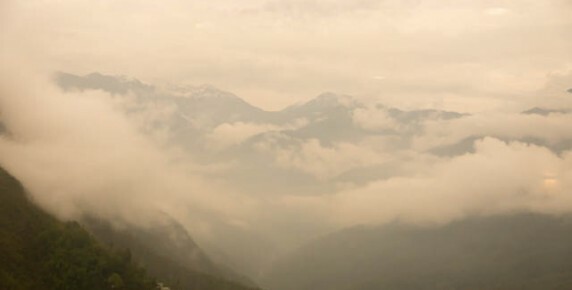 Despite the technical mishaps with the internet (it is the Himalayas after all, so a fiber optic high speed link was probably not a realistic expectation) we have managed to upload this second edition of our Sikkim trip blog and below follows what happened today. We started the day early with a series of talks and presentations by our hosts who welcomed us with unprecedented flattery and praise. We were also honored that the Health Minister of Sikkim (Mr D.N. 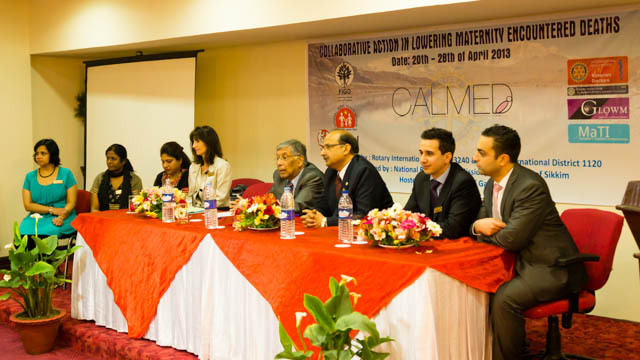 Takarpa) and the Health Secretary (Dr. K. Bhandari) also attended for the morning proceedings and inaugurated the CALMED programme. Their support is invaluable if the work is to be ongoing and sustainable. 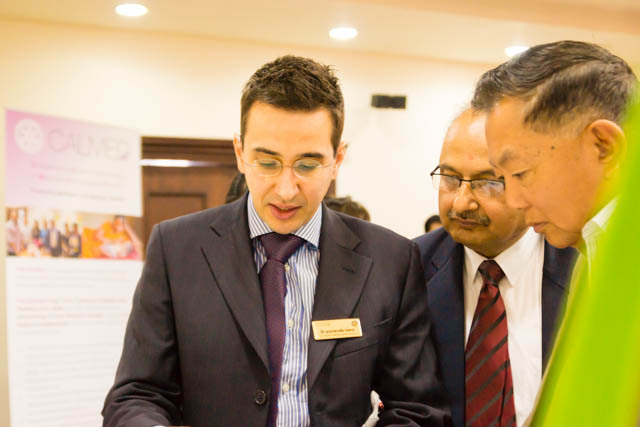 Following the talks, Ippokratis had the opportunity to show the Minister around some of the training material and resources brought by the CALMED initiative and its partner organizations for use in Sikkim. This material has been donated and will remain in Gangtok for use by the locally trained future trainers. As a final treat, articles about the programme were published in the two local papers (see picture below). With the formalities over and the ties off, now the hard work of mentoring and training the new faculty starts. And we couldn’t be more excited as this is what we love doing most… teaching. We have 14 delegates attending for the first part of the training, which is a mixture of local obstetricians and midwife trainers. 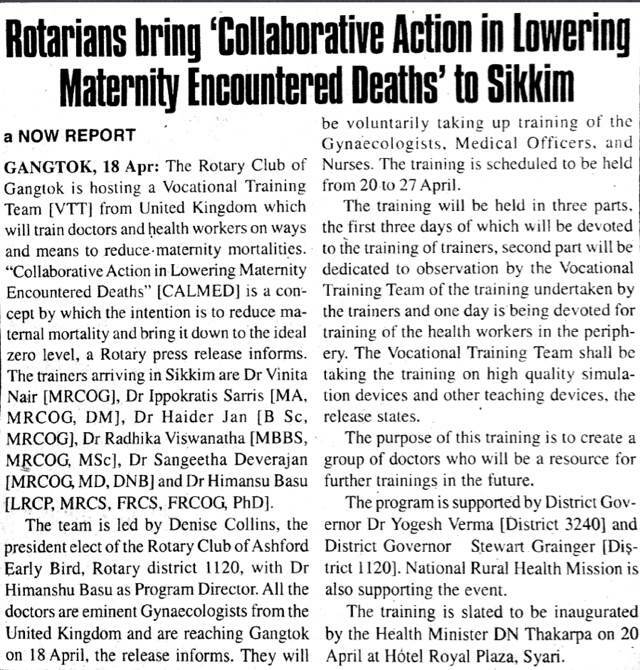 To our surprise, and delight, we found out that these are not just from Gangtok but also from the wider state of Sikkim and come from both peripheral and secondary health settings. Hopefully this will help with dissemination of knowledge even further than we initially hoped for. 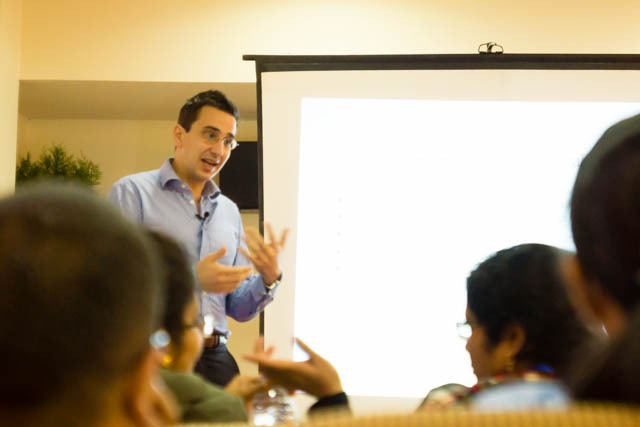 As a further incentive to them and motivation to us, our future local trainers have already been invited and requested to teach on local courses in Darjeeling and Kalimpong. This is an encouraging sign that the aim of CALMED in providing sustainable, locally initiated, capacity building is indeed a real possibility. 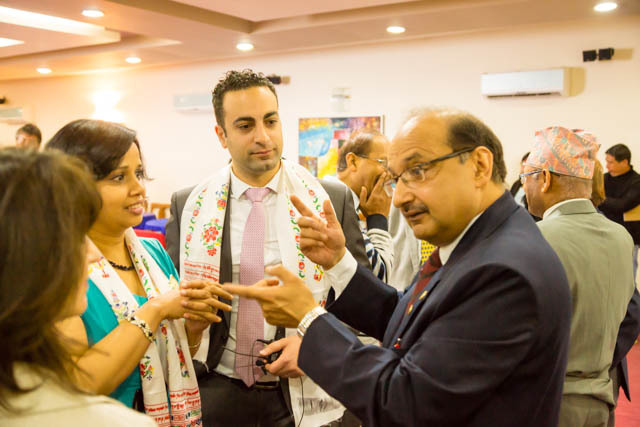 The enthusiasm of the delegates is boundless and we have rapidly built a warm relationship with them. They are eager to learn and then teach. They seem to be won over by the novel methods and equipment provided and found both the MaTI and GLOWM resources impressive. We started with a brief pre-course knowledge and skills test to identify areas of need and improvement so we can tailor our training to them. 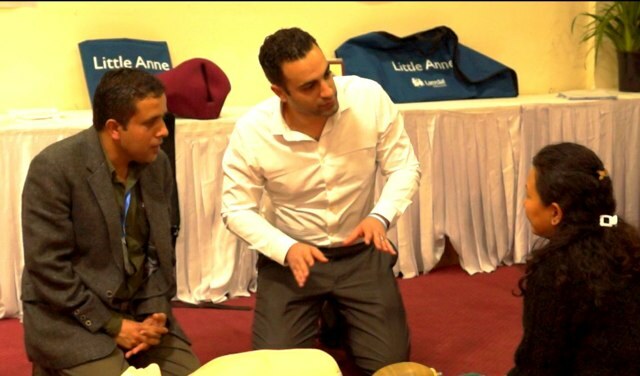 This was then followed a full programme of interactive lectures, videos, small group discussions and hands on skills. It has been a long day and for the VTT it has continued well into the night as we are preparing for the next few days. Feedback up to now has been positive and encouraging. To our surprise, our delegates seemed not to mind the late finish, despite them having given up their Saturday. In spite of the hard work, the day has been very enjoyable for all involved. Tomorrow our hosts have insisted (to our delight) that they are going to take us travelling around the area to showcase for us this magical part of the world. Although as a team we are eager to maintain the momentum we built today we have, with little resistance, accepted that perhaps Sunday is indeed a day for rest and enjoyment after all. We are therefore taking them up on this offer. More on that tomorrow though.